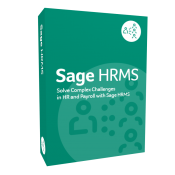 Provide an online application for job candidates where, once approved, their data flows into a new hire or rehire form within Sage HRMS. This functions as a basic alternative to Cyber Recruiter. 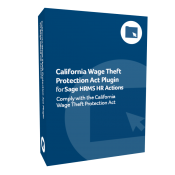 CA Wage Theft Protection Act Plugin for Sage HRMS HR Actions automates compliance with the Wage Theft Protection Act of 2011. 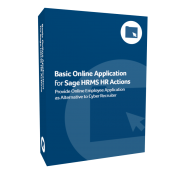 Streamline your applicant tracking and recruiting system with this powerful, cloud-based solution. 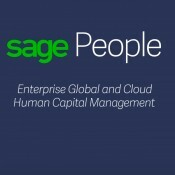 iRecruit for Sage HRMS, a hosted SaaS software solution, provides a simple, affordable way to manage your recruiting process online, no matter the size of your business. 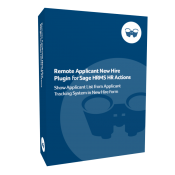 It automates the entire process from creating job requisitions to screening applications to hiring—and it integrates fully with either Sage HRMS or Sage Abra Suite. Populate the applicant selection drop-down field on a new hire form with information on ready-to-hire applicants collected by a third-party applicant tracking system. 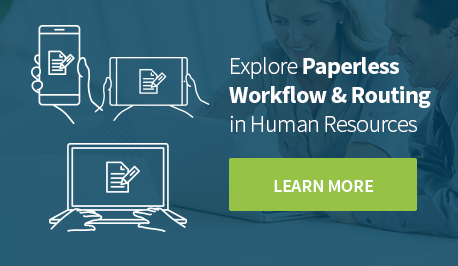 Move to paperless HR with the ability to quickly build web-based forms for routing and approval—No programming skills needed. 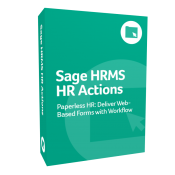 With Sage HRMS HR Actions, create unlimited customized forms that cover the entire employment lifecycle. 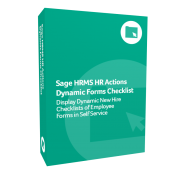 Display the right forms at the right time by presenting a list of specific forms to an individual employee or manager directly within Sage HRMS HR Actions. Ideal for the onboarding process, performance appraisal, goal setting, and annual acknowledgments. Streamline the Employment Eligibility Verification process with secure paperless completion of Form I-9 during the onboarding process or when updating or reverification is required. 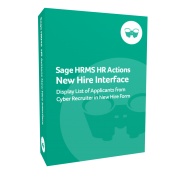 Eliminate duplicate data entry by automatically populating a new hire or rehire form with data transferred from Sage HRMS Cyber Recruiter. 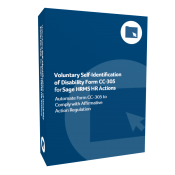 Stay compliant with federal regulations by offering new and current employees the ease of completing the Voluntary Self-Identification of Disability Form CC-305 in a browser, on a PC, or on a mobile device. 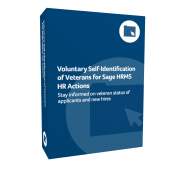 Voluntary Self-Identification of Veterans for Sage HRMS HR Actions provides an online form that allows applicants and new hires to identify as a member of one or more groups of protected veterans as defined in the Vietnam Era Veteran’s Readjustment Assistance Act (VEVRAA). The data collected provides employers with information required to remain compliant with section 41 CRF 60-300.42 of VEVRAA. Determine if your newly hired employees qualify as members of certain target groups and claim tax credits for those who do. 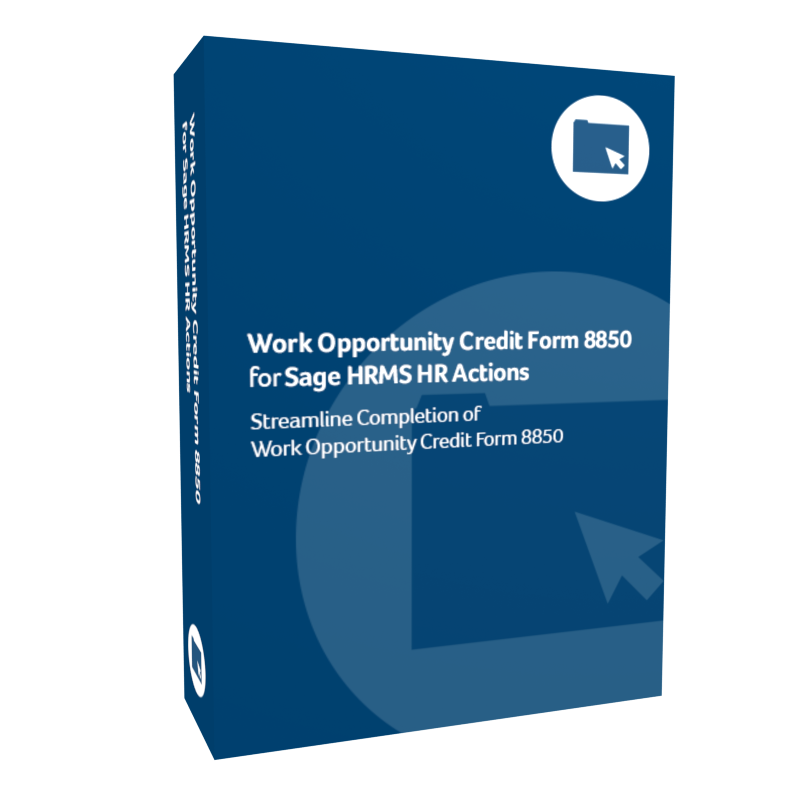 Work Opportunity Credit Form 8850 for Sage HRMS HR Actions streamlines the process by providing an online form for both employee and employer to complete. 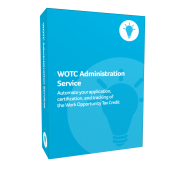 Automate the application process for the Work Opportunity Tax Credit (WOTC) and ensure you receive the maximum savings with WOTC Administration Service. This service does the work for you, automating the application, certification, and tracking of qualified employees’ time and wages while ensuring compliance with all federal policies.